Up until the late 16th century, everyone "knew" that the sun and planets revolved around the Earth. Up until the late 19th century, epidemic illnesses such as cholera and the plague were "known" to be caused by a poisonous mist filled with particles from rotting things. Up until the early 20th century, the most common procedure performed by surgeons for thousands of years was bloodletting, because we "knew" that blood drained from the body balanced the whacky humor responsible for poor health. But as misinformed as all that may sound now, our predecessors believed these "facts" with the same certainty that we believe that a dog's age at seven years per one human year<1> and that Vikings wore helmets fitted with horns<2>, right? As it turns out that if you believe these statements, your beliefs are incorrect, as well. Living in a time of such dazzling science and technology, we continue to stand firmly behind our beliefs … even if so much of what we think we know to be correct is actually wrong. Most of the more common misconceptions, ideas that may have started as myths or that came from a faulty study that was later proven wrong (like dogs and Vikings), but not before they were firmly established as beliefs, which have proven almost impossible for weaker, non-thinking individuals to let go of. However, our misconception of dogs and Viking don't really hurt anyone or do any great damage, other than offending our sense of being correct. However, a very different story emerges concerning our emotional beliefs and what love is or isn't. An agitation of mind; an excited mental state. Subsequently: any strong mental or instinctive feeling, as anger, pleasure, grief, hope, or fear, deriving esp. from one's circumstances, or mood. • a natural instinctive state of mind deriving from one's circumstances, or mood, as in "she was attempting to control her emotions, his voice was low and shaky with emotion, fear had become her dominant emotion." • instinctive or intuitive feeling as distinguished from reasoning or knowledge: responses have to be based on historical insight, not simply on emotion. ORIGIN mid 16th cent. (denoting a public disturbance or commotion): from French émotion, from émouvoir ‘excite,’ based on Latin emovere, from e- (a variant of ex-)‘out’ + movere ‘move.’ The sense ‘mental agitation’ dates from the mid 17th cent., the current general sense from the early 19th century. As we have just learned from the dictionary<3> meaning emotions are agitated feelings based on circumstances and mood. They play an extremely important role in our awareness, intelligence, social skills, and our ability to communicate. Most well-thought people can easily identify and describe the emotions of pleasure, grief, hope, or fear. We know with a great amount of surety when an emotion of fear comes over us, or an emotion of grief. And, while we may be able to identify and describe our emotions with great clarity, we often have difficulty controlling the circumstances of our emotions, feelings or moods. We often find ourselves overwhelmed with an emotion and tears roll down our cheek out of both pleasure and grief. "Every emotion has a specific function, a specific purpose, and a specific action for you to complete so that it can move on and make room for your next emotion, your next thought, and your next idea. As we explore emotions as distinct and separate entities that require unique responses." Yes, all emotions, feelings, and moods are constantly moving in and out. We are laughing at one moment and crying the next. We are extremely happy in one moment and become angry in the next. Every person has mood swings and it is considered a normal reaction to our circumstances. They are usually an action that comes over us momentarily due to the circumstances of our environment. We may experience an emotion of pleasure until someone makes us feel sad. Our emotions turn from happiness to anger because someone says, or does something, that changes that emotion. And, these normal emotions that are felt by everyone, have been responsible for an extensive amount of damage inflicted by those who do not have an understanding of that all emotions are nothing more than a momentary outlet that will rise and subside based on nothing more than the way in which we communicate. Often, the lack of empathy is also to blame. Have you ever said something to another person and had them react in an emotional manner that caused you to cry or fear them? Sure you have! Those that have empathy for others would understand that this is a natural reaction and feel guilty or ashamed of creating unhealthy emotions in another person. Just as you would have an emotion of pleasure if you had said something that brought them happiness. And, if you felt an emotion of fear or unhappiness repeatedly, you would know that there is something wrong. And, that brings us to this week's subject: that Love is a Gift - Not an Emotion. Any person who has opened their eyes to the world around them have noticed that there is a problem with how they interpret love. We entered into a loving relationship with the intent of it lasting forever, yet that is often not the case. Past statistics have shown that in the U.S. 53% percent of first marriages, 67% of second, and 73% of third marriages end in divorce. Today, one in four marriages fail in 58% of all countries. (Download available here) What are the reasons for this high and progressive increase in divorce rates? Conventional wisdom tells us that those who do not learn history are doomed to repeat it, so why are second and third marriages so much more likely to fail? Could it be that we are wrongly interpreting the meaning of love? Is it that there are expectations are not being met? The research has shown that in the case in the great majority of failed relationships. Those who believe that love is an emotion are doomed to failure. As long as we allow song lyrics to guide our beliefs about important things such as love, with their only need to sell music and earn a living, we won't get far along the road to being happy and loved. This is because healthy emotions arise only when they are required, they shift and change in response to a person's environment, and it recedes willingly once the emotion has sufficiently addressed an issue and are no longer needed. When we believe that love is an emotion, we allow it to change in response to our whims. Real love when healthy, does none of these things. Real love repeats itself endlessly, and hopefully with the same intensity over and over, every day of your life and even beyond death itself. We continue to love others even after they have died. Unlike an emotion, love does not increase or decrease in response to its environment. Real love is categorized differently. Love is not an emotion and it does not behave in the way that emotions do. If it did change with like emotions, then we would question its existence in our relationships. If we fell in love with another, who consistently and repeatedly changed their mind and kept running away from the relationship as their love wavered, we would begin to realize that there is something terribly wrong with the way in which they love. Only an empath, who was raised or exists in a narcissistic lifestyle would allow their love to waver with the tides. No, real love never wavers. We stay the course and stay in the relationship if real love exists. And, even when someone is too dissimilar to remain in a relationship with, we may not continue to live with them, but we don't stop loving them. We do equate some things with love – the addictive cycles, desire, longing, lust, passion, physical attraction, projections, sharing, yearning, and more – those things that change, fluctuate and move in the ways emotions do, but these things are not love in themselves. We can be frightened with people we love, furious with them, and become disappointed with them, but the love never wavers like an emotion. When we truly love another person, we can experience all of our free-flowing, mood states, and intense emotions – anger, fear, grief, guilt, hatred, rage and shame – and continue to love and honor the person. 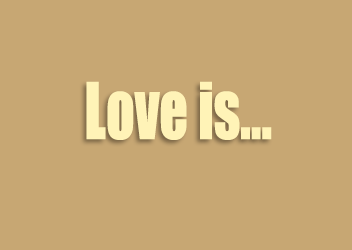 Because love is not the opposite of anger, fear, or other emotions. Real love is much, much deeper than that. And, if you allow your emotions to drive the love for another, then you are not really in love, you are simply in an emotional state, and likely only feeling the emotion of co-dependency. If you really want to experience true love, you have to move past your unhealthy emotional states. In some relationships, the only glue that holds two people together is adoration, which is merely projection. A person with low self-esteem becomes love-struck when the find a person who adores them and lives in a trance-like state. And, the relationship continues until one or both realize that the only thing holding them together is based solely on the desire to be admired. When the projection fails, they see the person for who they truly are and become disillusioned. The only recourse is to attempt to reattach the projection or see another who will fulfill the emotion of desire. That's not love - because real love does not play games. It is not dependent on what one can project onto another, or what they can receive from a relationship. Real love is a gift that we give to another person – hoping that they will accept it, honor it, and hold it forever – and we never take back. Real love is a commitment, a promise, an unwavering dedication to a loved one, to be there for them, forever. Emotions and desires can increase and subside as they will. Circumstances can change rapidly, but real love never subsides. It grows stronger, enduring all the emotions that come over us. It survives betrayal, death, divorce, and yes, even trauma. I have loved many and have failed many times. In searching for the answers as to why my relationships failed – using critical thought – I have come to the realization that in every instance my partner believed love was an emotion that they could turn on and off as their mood changed. I loved unconditionally and they loved by nothing more than emotion. As Dr. Wayne Dyer wrote in, "Real Magic: Creating Miracles in Everyday Life:<5>"
"My purpose has been clearly revealed to me through the process of prayer and meditation. It matters not all to me how others view my behavior in getting to purpose in my life. The knowledge that I have has been revealed to me in the clearest and most profound manner. My purpose is to give, to serve, to promote peace and prosperity and to become totally, unconditionally loving to all people." Legendary Vietnamese Zen Buddhist monk, teacher, and peace activist Thich Nhat Hanh explores in "How to Love"<6> — a slim, simply worded collection of his immeasurably wise insights on the most complex and most rewarding human potentiality. Love is being totally, unconditionally loving towards others, with understanding, and to accept others as they are with compassion at all times. Love is not an emotion or feeling. Love is constant. Love is in the hug of a child, the rich concern of a good friend, in the center of your family, in the soul of your pets and can be realized in a relationship if we only accept love for what it really is and cease treating it as what it is not. If love is failing or has failed you, you are to blame for not truly realizing that love is a gift that you give to another and that you will sometimes receive in return. Act in a loving manner and you will find your love enriched. 1. Your 3-year-old dog is 21 years old in human years, right? Not according to experts. The general consensus is that dogs mature faster than humans, reaching the equivalent of 21 years in only two, and then aging slows down to more like four human years per year. "Dog Whisperer" Cesar Millan recommends this way to calculate your dog’s human-age equivalent: Subtract two from the age, multiply that by four and add 21. This makes your 3-year-old dog actually 25-human-years-old. 2. Is there anything more "Viking warrior" than a helmet fitted with horns? Nary a portrayal shows the seafaring Norse pirates without the iconic headgear. Alas, horned hats were not worn by the warriors. Although the style did exist in the region, they were only used for early ceremonial purposes and had largely faded out by the time of the Vikings. Several major misidentifications got the myth rolling, and by the time costume designers for Wagner’s "Der Ring des Nibelungen" put horned helmets on the singers in the late 19th century, there was no going back.